HÀ NỘI — San Miguel, the Philippines’ largest brewery corporation, is “evaluating and may bid” for Việt Nam’s Saigon Beer Alcohol Beverage Corporation (SABECO), company president Ramon Ang told Bloomberg reporters on March 31. Việt Nam may provide an anchor to increase firm’s brewery business, as consumption in the country is growing at an annual rate of at least 10 per cent, five times that in the Philippines, he said, adding that his company sells nine out of every 10 beers in the Philippines. “The businesses we ventured into have matured, therefore the company is in a very stable position,” Ang said, citing compounded annual growth of 20 per cent in recurring profit and a near fourfold increase in assets since 2008 following San Miguel’s diversification from food and drinks into non-allied industries such as toll roads and resources. Excluding one-off items, profit will rise at least 20 per cent, to some 60 billion pesos (US$1.2 billion) this year, he said. 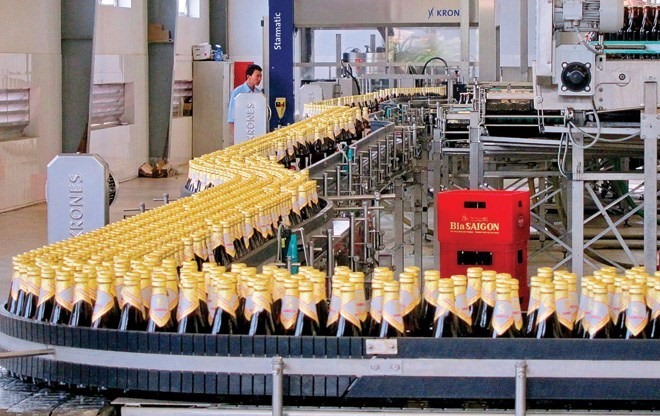 Saigon Beer, or Sabeco, Việt Nam’s largest brewer with 40 per cent market share, has received government approval to hire consultants to advise the State-owned company on its planned stake sale this year. Heineken NV, Anheuser-Busch InBev NV and Asahi Group Holdings Ltd are among seven foreign companies that previously registered bids. Lý Minh Hoàng, head of Sabeco’s Shareholders’ Relations Department told Việt Nam News in a telephone interview on Tuesday that he was aware of the news reports but Sabeco was yet to receive an official offer from the Filipino company.